TGIF - so happy it's Friday! I am so happy the weekend has finally arrived! Any big plans this weekend? the DT for Jane's Doodles!!! Yippee!! I love Jane's sweet images, and now I get the chance to create with them! :) Stop by the blog to check out all the wonderful inspiration the rest of the design team has created for you! 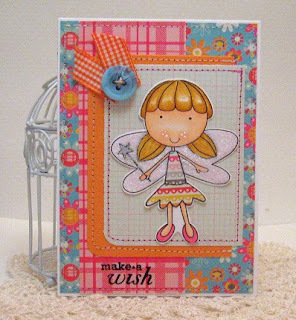 DP's from MME, cardstock, button, twine and sentiment stamp from PTI. Misc. ribbon and glitter all have been added. What a wonderful, happy card! Love the bright colors, the layout and your coloring. Welcome on the team!